This customer used our 12VDC Ribbon Star Max White Waterproof Strip Lights to redo existing color changing RBG strips that were previously installed on the lip of his outdoor patio counter top. We received a phone call inquiring about replacing the existing 4 wire RGB color changing strip lights because LED sections keep going out. Rather than simply shipping him new strip lights we researched the problem and discovered that his 12V source was actually 12VAC (typical for landscape lighting transformers) which was causing the failures in the 12VDC strip lights. 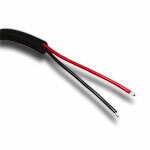 We recommended that he purchase a compatible 12VDC, 60W Waterproof Power Supply for his new new strip lights and even cut and soldered the custom lengths so he could easily install his new lighting with the existing wiring in place. Once he received the order it didn't take him long to install the new white strips light that will be sure to last much longer than the old strip lights. In his own word he said, "I wanted to thank you for the fantastic service you provided. The LED lights are awesome!!!" Our high end UL Listed Ribbon Star Max Waterproof flexible LED Strip Light is a perfect solution for both indoor and outdoor task, backlight and ambient light applications. The waterproof Ribbon Star Max LED Ribbon is fully encased in a dependable waterproof and UV resistant silicon coating for an IP67 rating. This 118" (3 meters, 2" under ten feet) ribbon can be cut every one inch. 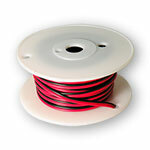 Ribbon comes with 3M™ VHB™ mounting tape on the back, for the best long-term mounting solution. Each roll comes with 10 clear plastic screw down holders, 4 closed end caps, 4 end caps with holes for wiring, and a waterproof connector at each end. 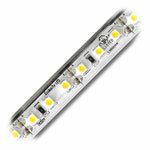 Three (3) SMD LEDs per one inch, 2.92W per foot of Constant Voltage DC power required for this strip of light. Can be used for outdoor lighting, decks, patios, coves lighting, toe kicks, under cabinet, backlighting, crown molding and many more applications. 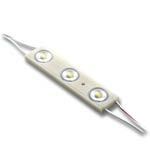 UL listed for class 2 low voltage luminaries and fixtures, RoHS and CE approved, 6000-6500K Color Temperature. This 60 Watt Constant Voltage LED Power Supply by Mean Well is suitable for wet or dry locations and is capable of supplying no more than 60W or 5 Amps of 12VDC power output. This AC/DC transformer takes a 100-240VAC input and converts it to a 12VDC output for a Class 2 rating. 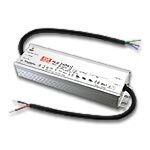 Built in overload, and over voltage protection protect this power supply from incorrect installation. Use this Mean Well LED Power supply to power 12VDC constant voltage LED Strip lights, LED Modules, or any other LED product with a 12VDC rating. The IP67 water-resistant rating is not intended for direct exposure to outdoor elements. UL recognized, class 2, and LPS approved.